The Global Volcanism Program has no activity reports for Aliso. The Global Volcanism Program has no Weekly Reports available for Aliso. The Global Volcanism Program has no Bulletin Reports available for Aliso. The newly discovered Aliso volcanic complex lies at the eastern foot of the Ecuadorian Andes, east of Antisana volcano and SW of the town of Baeza. The largely unexplored complex contains an arcuate summit ridge on the west with older andesitic lava flows and tundra-like vegetation, and rhyolitic and dacitic lava domes in a wet cloud-forest environment on the lower eastern flanks. The Pumayacu center on the SE flank contains several lava domes along a NNE axis parallel to the Andean Thrust Fault System (TFZ). Morphologically young andesitic lava flows occur along the flat-topped ridge above Baeza town. The Pumayacu center erupted pyroclastic-flow deposits of late Pleistocene and Holocene age. One pyroclastic-flow deposit was dated at about 4400 years Before Present, and a pumice lapilli layer overlies a ceramic-rich cultural horizon thought to be about 2000 years old. Hall M D, Mothes P A, 2010. New active rhyolitic eruption centers - eastern foot of the Ecuadorian Andes. Cities on Volcanoes 6, Puerto de la Cruz, Tenerife, 31 May-4 June, 2010, Abs, p 44. There is no Deformation History data available for Aliso. There is no Emissions History data available for Aliso. 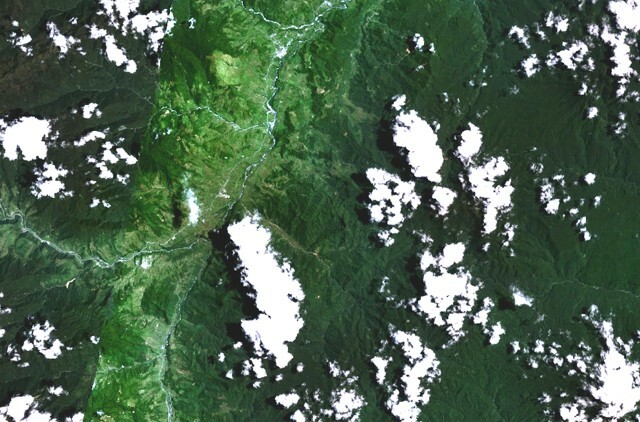 The forested volcano partially obscured by clouds to the right of the center of this NASA Landsat image (with north to the top) is Pan de Azúcar. This 3482-m-high volcano lies in the jungle east of the town of Baeza, which is located along the Papallachta River extending horizontally across the image at the lower left. The Global Volcanism Program has no maps available for Aliso. There are no samples for Aliso in the Smithsonian's NMNH Department of Mineral Sciences Rock and Ore collection. Large Eruptions of Aliso Information about large Quaternary eruptions (VEI >= 4) is cataloged in the Large Magnitude Explosive Volcanic Eruptions (LaMEVE) database of the Volcano Global Risk Identification and Analysis Project (VOGRIPA).